If the Thomason family of Zion Lutheran Church in St. Charles, Mo., hadn’t listened to their 14-year-old daughter, they may not have sought shelter in the basement May 31 when the tornado sirens blared near their home. Joe Thomason, according to his wife, Michelle, would have normally watched the approaching storm from the dining room window. The dining room window where Joe Thomason liked to storm watch was gone. The Thomasons were one of three LCMS families from Zion and Messiah Lutheran Church in Weldon Spring, Mo., whose homes were severely damaged by nine tornadoes that swept through the St. Louis area May 31. Six LCMS members from Trinity Lutheran Church in El Reno, Okla., also suffered severe damage to their homes when a record-setting tornado came through Oklahoma the same night. About 100 Trinity members had hail or wind damage to their homes or property, said Trinity Pastor Donald Hefta. The roofs of Trinity and Hefta’s parsonage have to be replaced because of hail damage. No LCMS members were injured in the severe storms, but Yolanda Santos, a housekeeper at Concordia Life Care Community in Oklahoma City, Okla. — an LCMS Recognized Service Organization — and her three children, ages 5, 7 and 9, died as they tried to seek cover from the tornado, said the Rev. Ron Simpson, LCMS disaster-response coordinator in Oklahoma. According to an announcement from the RSO, the Santos family and another family were swept away by floodwaters during the storm. In the St. Louis region, the tornadoes injured two people and damaged hundreds of homes and buildings in Missouri and Illinois, including Lambert International Airport. Nearly 100,000 people were left without power for several days. Several LCMS families also had downed trees or had damage to the roofs and siding of their homes, said LCMS Missouri District Disaster Response Coordinator Jim Eckrich. One family at Messiah Lutheran in Weldon Spring had significant damage to their home, said Laura Fleetwood, the church’s communications director. The same storm system that rumbled through the St. Louis area also came through El Reno, Okla., May 31. The Oklahoma tornado was classified as an EF5 tornado — the strongest — with winds that neared 295 mph. It killed 20 people, including three storm chasers. The National Weather Service reported the tornado as the widest ever recorded. It grew from one mile to 2.6 miles wide in 30 seconds. During the tornado, Trinity Lutheran Church in El Reno, one of the city’s few designated storm shelters, opened its basement to more than 200 people and their pets, including a monkey, said Tim Hetzner, LCMS disaster-response coordinator for the LCMS Northern Illinois District and president of Lutheran Church Charities (LCC) in Addison, Ill.
Church members also helped people with minor injuries who came to the church after being stranded on the highway during the tornado, Hefta said. About 25 of them spent the night at the church. One day later, LCC Comfort Dogs were on hand at Trinity to provide relief to those suffering from the tornado’s destruction. The dogs visited with tornado victims in Oklahoma for three weeks. Hefta has been visiting people in the damaged areas, praying with them and handing out LCC gift cards to help offset some of their expenses. In response to a May 19 tornado that killed one man and ravaged a mobile home park in Shawnee, Okla., Redeemer Lutheran Church members have adopted 20 members of the community for ongoing relief and recovery assistance, Simpson said. 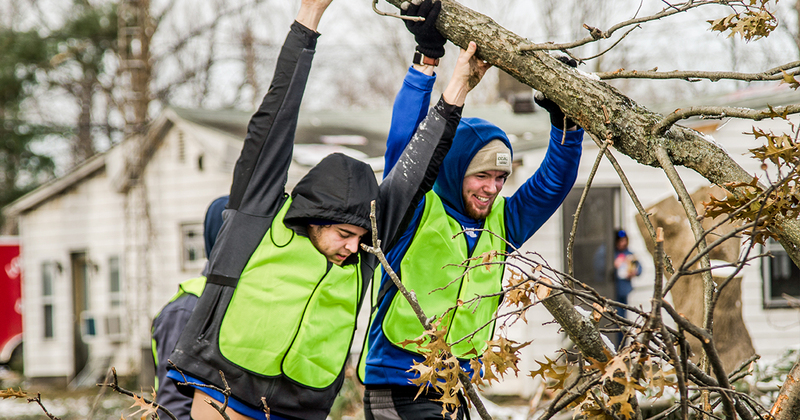 Meanwhile, in the St. Louis area, about 30 volunteers with the “Helping Hands” team from Messiah Lutheran Church went out two days after the tornado and helped remove downed trees and clean up debris from the tornado that hit the area. Fleetwood said the congregation is in regular touch with the one LCMS family affected and others dealing with significant cleanup due to downed trees. The Sunday after the storm, Messiah Lutheran Church, with help from Thrivent Financial for Lutherans, collected $3,500 to assist the victims. The May 31 tornadoes came after the an EF5 tornado hit Moore, Okla., May 20, killing 24 people, injuring hundreds and damaging thousands of homes and building. At least nine LCMS members lost their homes from the Moore tornado and a May 19 tornado that struck just east of Oklahoma City. St. John’s Lutheran Church in Moore and Trinity Lutheran Church in Norman, Okla., are continuing to assist with the relief efforts. St. John’s has offered summer camp scholarships to families who lost their homes. The church also is acting as a distribution center for relief. 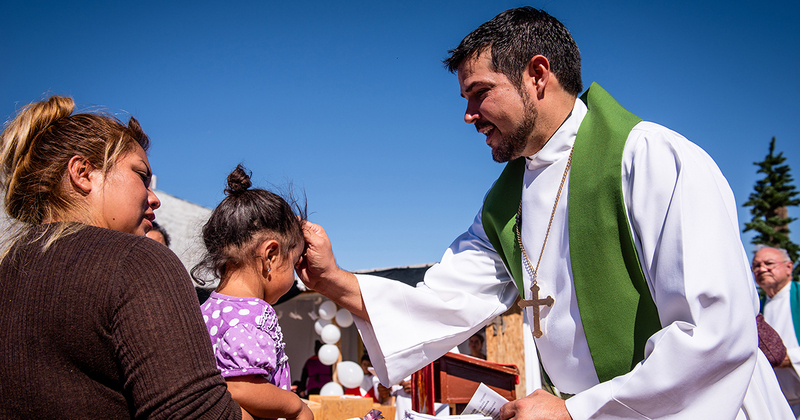 “LCMS Disaster Response continues to be in contact with congregational and district leadership in the affected areas, providing care and concern through prayer, consultation in developing plans for sustained relief, and financial resources made available by the generous outpouring of donors,” the Rev. John Fale, associate executive director of LCMS Mercy Operations, said after the May 31 tornadoes. “I encourage all of our congregations to keep these folks in regular prayer in the weeks and months to come, asking our Lord to bring comfort and healing through the promises of His Word, which never fail, and through the love and help of those who care about them. For those interested in volunteering for tornado cleanup in Moore, Okla., St. John’s Lutheran Church, with the help of Lutheran Church Charities, is providing volunteer registration for individuals and groups. 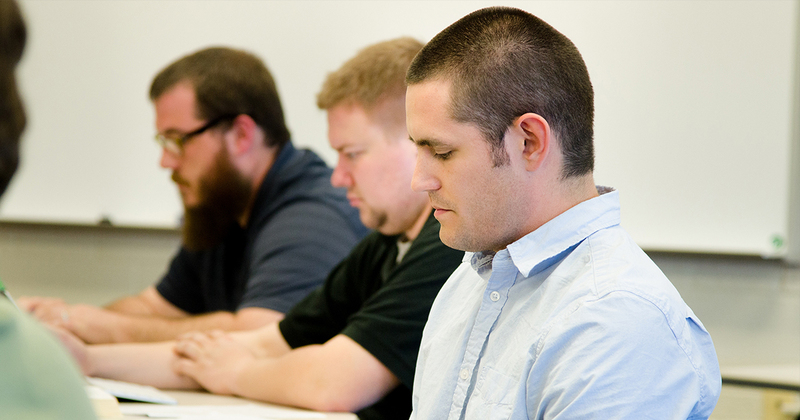 For registration forms on the congregation’s website, click here. All volunteers must complete an individual registration form. Call LCC at 866-455-6466 or send an email message to LCC@LutheranChurchCharities.org with any questions. As for the Thomasons of Weldon Spring, Mo., they stayed in a hotel for a week and are now renting a home until repairs can be made to their tornado-ravaged home. Thomason said Zion Lutheran members have “definitely proven we are family,” she said. “I feel the blessings we’ve received, and seeing how many people care for us has outweighed the bad part. It’s going to be a long process, I know. But my family is okay.